News! 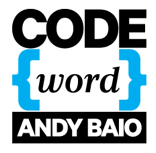 This week, I started writing Codeword, a new weekly column for Wired.com. I’m covering a mix of data journalism, Internet culture, indie gaming, or whatever else I find interesting — the same kind of thing I’ve written here for almost a decade. As part of the arrangement, I retain joint copyright and can republish my columns here after 24 hours, which I’m very happy about. My first column went up on Wired yesterday, a thinly-disguised rant on Google’s removal of the + operator from search, which I noticed last Wednesday. Obviously, this change isn’t the end of the world, but it got me thinking about how the importance of alpha users changes as services grow in popularity. I hope you enjoy it. Take the recently-announced changes to Google Reader, for instance. Reader is the most widely-used and deeply-loved feed reader ever made, steamrolling over several startups in the mid-2000s in the process. Any startup would be thrilled to have their devoted audience; within Google, Reader seems like a distraction. Maybe it’s just me as a librarian but I have always used quote marks and Boolean Operators when looking for phrases/word combos. My understanding is that google pays attention to data (in this case, data it gathers on how its search engine is used) more than to its users. While this may seem wrong, it really isn’t. The data regarding usage is “pure” whereas users will bias what they say based on their experience, knowledge, preferences, etc. I’m a design researcher, so I know about this stuff. Obviously, I don’t know what google’s thinking really is, but I’d wager that their data is telling them that there is an overall benefit for the most users by removing the +. I like the + and I’m sad to see it go. But I’ve rarely been let down by google, so I’m happy to give them the benefit of the doubt. Of course, that was the basic premise of my article… The needs of the many (mainstream, non-technical users) are far outweighing the needs of the few (power users). I’m sure Google’s changed are making things better for those users, at the cost of potentially alienating their original core base. I agree with your analysis, but I dispute the conclusion that this was always the destiny of Reader Share. Yet another entry in the Disturbing Internet Trend of treating users as consumers instead of creative peers. Rumors coming out of the Silicon Valley… a new networking platform with advanced search capability that allows a non-nerd to find people for business, research, venture capital, business plans, marketing ops, etc. The platform is HD video-based. see me now is the phonetic name for it. I haven’t seen a logo yet. nothing shows up on Google (surprise). Anyone heard or seen anything about this? While this might be upsetting to people now.. I don’t this it will have any long term implications. They didn’t actually remove the feature, they just changed how you have to do it. I personally have very rarely used the + operator in google. I myself have always used quotes. Maybe searching methods like what I use are more prevalent among power users than you think? Only Google knows. Yesterday, the Google Reader team rolled out the new Google Reader to almost unanimous disapproval. Almost no one likes it ( http://www.google.com/support/forum/p/reader/thread?tid=5a14d4898b83412c&hl=en ). I thought Google was supposed to be this leading edge tech company. More like the Wizard of Oz. Turning some searches to OR is annoying, but doing so without any notification is completely user unfriendly. The plus and quote operators were never really synonymous, though, were they? Quoting is useful as a means of indicating the exactness of a search term. The difference between a quoted and unquoted search for web is that the latter will also match pages that include webs, website, etc., while the former only matches exact instances of the word “web”. The plus operator is (err, was) a means of indicating the necessity of a search term. Google uses the context of links to a page in addition to the page’s own content when evaluating its relevance for search terms — this meant that results could occasionally include a page that didn’t include one of your search terms, but was still deemed relevant to your search because the term was present in a context that linked to that page. The plus operator overrode that behaviour, and signalled that the term must be present in the actual result. Both are, to a degree, pro tools to override Google’s prevailing guess-what-you-really-meant behaviours, but they were not synonymous in concept or in function. I just did a couple quick tests, and the current behaviour for quoted terms seems to include an implied +, but I don’t know if that’s always been the case. More importantly, the change removes the ability to force a +ed but not quoted behaviour: There are situations where I absolutely want pages containing a certain search term, but I’m not picky about the form of that term (e.g., I’m open to pluralizations or synonyms). There seems to no longer be a way to specify that. This description remained essentially unchanged up until the + went away last week. Note that this says nothing about the *necessity* of the term (as you describe it). There was no operator that limited your results to pages *containing* your search term. I suspect people have been attributing that behavior to + for years, out of habit, wishful thinking, or (perhaps) an undocumented weighting factor that Google has been phasing out. SRC: Yes, it was standard for search engines. 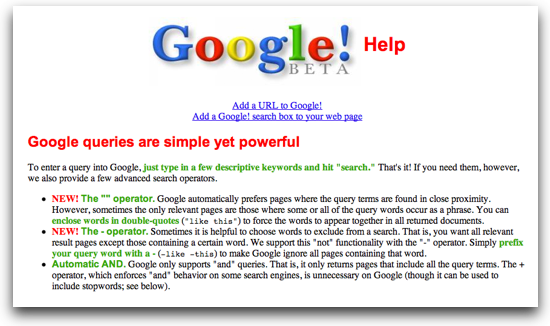 As Google said in their 1999 help pages, the big innovation was that you didn’t *need* to use it, unless you were searching for stop words. Every search was an AND search, until Google started changing it a couple years ago. Ahh. Thanks. I humbly stand corrected. You may also use the tilde operator to specify that synonyms are fine, e.g. “~web”, or the wild-card (*) operator for, um, wild-cards, but I’m not sure if these work inside quotes the way you would expect. By the way, Code Search has not been closed yet. Rather, it has been announced that it will be closed early next year. I don’t think Google invented this + symbol. It was part of other search engines before. Never said they did. In fact, I think I was pretty clear about that when I mentioned that their help page from 1999 said the “+” symbol wasn’t necessary, unlike other search engines of the day. I must say I did realise that google search was getting more and more difficult to get thru. i personally am a power user (might not use reader) but i literally grew up with google! i know the guy who made it (indirectly) but as soon as i had my pc with 8 is when google started and since then nothing else. At first I was a little upset at reading this, until I realized that I actually use “quotes around an exact phrase” and the – far more frequently than I use + as a search operator — both of which still appear to work as I need them to, to whittle down results. I frequently search for mutli-word media titles, such as the film “Martha Marcy Mary Marlene” (and I had to use [“movies from 2011” mary] minus brackets, to find the title I couldn’t think of just now). The only reason I can recall having ever used + is to deliberately include a word in a search result, to the opposite effect that adding – before a word removes results with that word in it. Memorable searches have had over a dozen -excluded words. For instance, I just tried searching for the above title using only [mary movie 2011] but got so many stray results I had to modify it with [ -kay -margaret -bridal -jesus -meeker -louise -2.0 -sister -bloody -proud -blige -buttons -hello -ward -christ -call -surratt -olsen] before giving up, although still glad that the -exclude option remains. I was using include and exclude searches for things back when Infoseek was my primary search engine, before it got purchased by ABC/Disney. Check out this opera extension I wrote. It automatically puts every word intelligently in quotes, also tries to disable google instant and what not nonsense they messed it up with since 2007. Just wrote it today, works for me, will develop it further some time for fun. I just want a way to make search for what I tell it to and not just whatever the hell it wants! Its like googles tripping you And saying I just tripped you because I knew you didn’t want to go that way! See I helped! I’m helping! !